A failed businessman unlawfully killed his wife and daughter before killing himself, a coroner has recorded. Christopher Foster, 50, shot Jill, 49, and Kirstie, 15, while they slept before burning the family mansion in Maesbrook, Shropshire, last August. The inquest saw CCTV footage showing Mr Foster setting fire to his luxury home and walking around with an object thought to be a gun. The inquest heard Mr Foster had debts of at least £1.2m. His thermal insulation business Ulva Ltd had gone into liquidation in 2007. 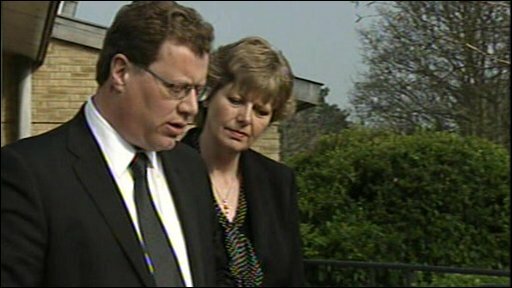 Recording his verdict, coroner John Ellery said Mrs Foster and her daughter had "everything to live for". He added: "Mrs Jill Foster and her daughter Miss Kirstie Foster were both shot in the head. "They were shot in their respective bedrooms almost certainly whilst asleep. "They both had everything to live for and Kirstie had her teenage and adult life ahead of her." He said Mr Foster had "quickly and methodically" killed his family and set their £1.2m home on fire. He said he was likely to have shot his wife first and then his daughter, to avoid the risk of his wife's "interception". A Home Office pathologist found Mr Foster died as a result of smoke inhalation but a loaded rifle was recovered from near his body. Mr Ellery said it would never be known whether Mr Foster had intended to turn the gun on himself before he was overcome by the smoke. The Shrewsbury inquest heard Mr Foster was facing personal bankruptcy and had told his GP he felt suicidal. He had also told a business associate, Mark Bassett, he would rather take his own life than lose his family home. Financial investigator Patrick Kelly said Mr Foster had mortgaged his home three times and had 20 different bank accounts, one of which was overdrawn by £330,000. When his company was put into liquidation, a £3m freezing order was put on his assets, leaving him without an income. 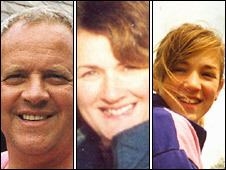 Det Supt John Groves, of West Mercia Police, said outside the inquest it was a "very sad case and tragic case". He added: "Now the inquest has concluded and we have the verdicts I hope it offers some sort of closure to the Fosters' loved ones and they can begin to move forward and rebuild their lives." Andrew Foster said outside the inquest his family were "shocked" that police were not informed about the mental state of his brother, who held a firearms license. The inquest heard on Thursday that Association of Chief Police Officers and the British Medical Association were planning guidelines to improve communication between GPs and police forces. Mr Foster said: "What has shocked us as a family over the last six months is the failure of the different branches of public service to work together, even with the objective as essential as the prevention of life threatening violence. "It's become apparent that Christopher had been mentally ill for some time and had discussed with his GP and other people that he intended to take his own life. "We are not apportioning blame or condoning Christopher's actions during the morning of the 26th of August last year. "But we wish to highlight that preventative measures such as improved communication between GPs and police forces firearms officers in the future could help stop a similar tragedy happening to another family. "We are encouraged to hear about the steps that are being taken to redress this issue." What is known about Mr Foster?